Today saw myself and Louis Rawlings take the chance to ride on a vintage steam locomotive (This being a Pannier Line for the first time in 50 years (excluding last weekend!!). 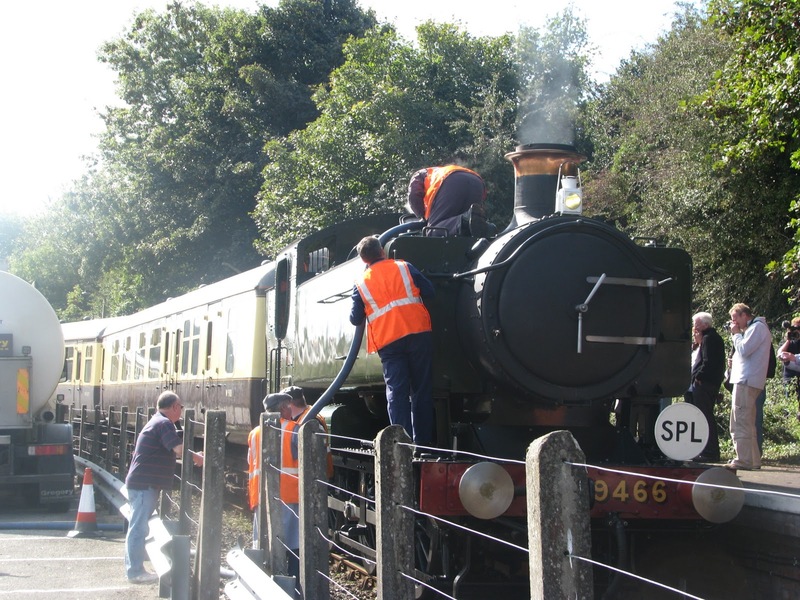 This was part of the ongoing programme of events to celebrate the 175th anniversary of the Great Western Railway. The fare for this railtour was very cheap at just 25 pounds a head! Sure enough it was only an hour, give or take a few minutes, but it did include 2 classic modes of traction, this being the afore mentioned Pannier Tank and a classic Class 37, this being 37685. 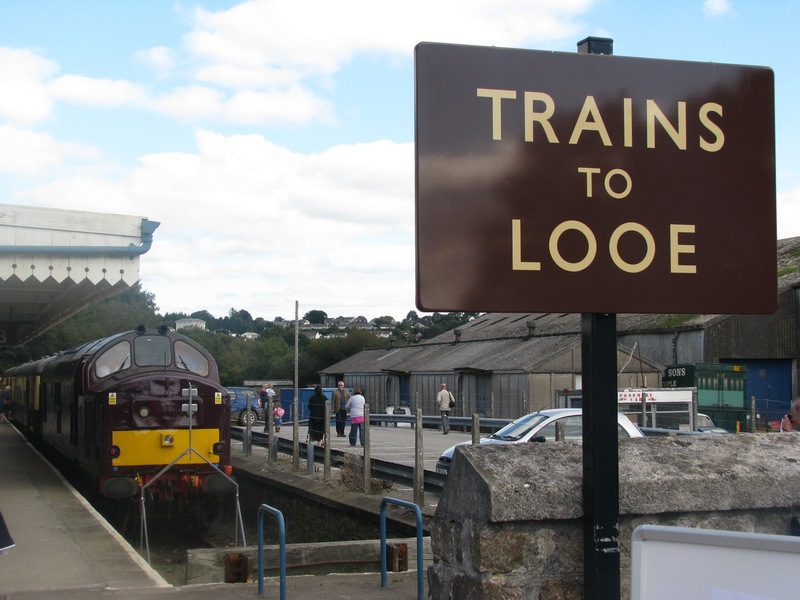 Both drivers gave them a really good running along this really picturesque line, and with the GWR style signs that have been in place along the Looe Valley Line for some time now by FGW, you really felt you were back in the Golden Age! A really fantastic time was had by all with many travelling some distance to get there, luckily for us it was only 'down the road'. Today I had a lucky moment when I met Western Greyhound's new Mercedes Citaro BU53 ZWZ on Union Street this afternoon while walking up through. Here she is working when she has been bought to do, the 576. The WG service has proven very popular and its not uncommon to see people standing when the '59' reg Solos are operating the route. Of course the Citaro will be able to provide additional capacity on the peak journeys. I must admit this one really does look stunning complete with the green LED blind. 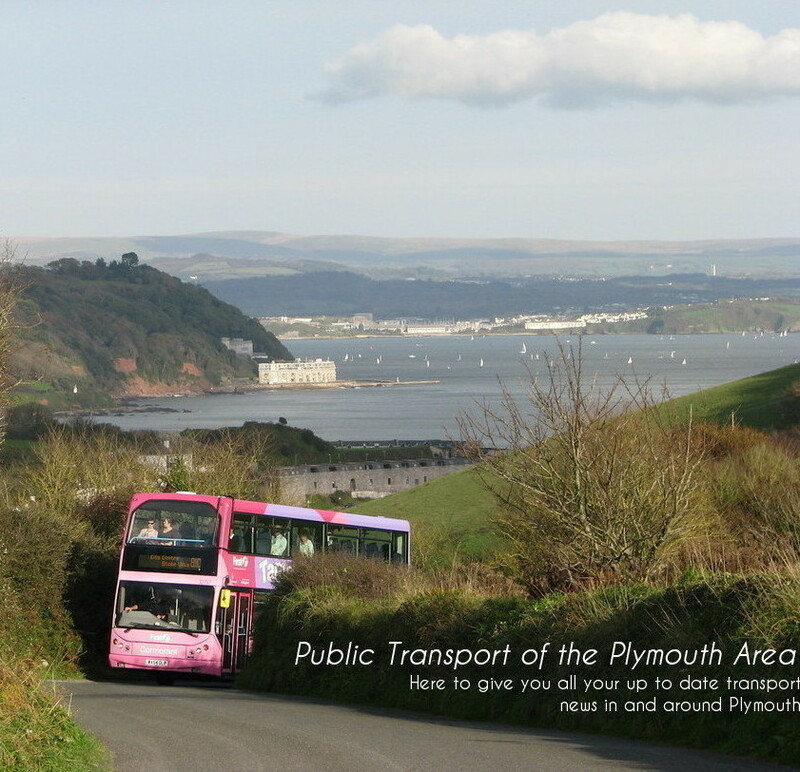 A real breath of fresh air with the rather drab colours of buses in Plymouth. Its also great to see WGL doing so well and being able to invest further. Indeed its that time of year again, where the 'WHOTT weekend' takes place in Devon. For the 3rd year Saturday's event will be held in Kingsbridge from 10 o'clock followed by the Exeter Westpoint Rally on Sunday. I must admit Kingsbridge is the rally I do look forward to most on the calender. It always brings a great mix of vehicles along with some really interesting routes, and simply generally a really well planned and interesting rally that shouldn't be this. As a 'bonus feature' to this year's rally, they will be celebrating with a 50 anniversary event for Bristol SUs with 6 expected to be running/attending. As to Exeter, this is now in its 8th year and often draws a large crowd. Exeter is quite a diverse rally with a lot of variety old and new to be found on exhibit, as well as trips around the showground and Westpoint, into Exeter City Centre, and mystery tours during the day. So do go along for an action packed weekend! With thanks to Matt McWheeney I can bring you this photo the 2nd PCB Dart that has made it to Halifax, this being K110 SFJ. Of course unlike L126 which had only recently been withdrawn, K110 has been out of action for a while now. 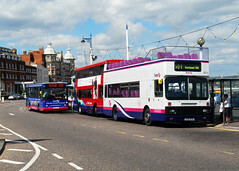 Interesting that both the buses sold weren't from the K reg batch. Maybe other members of the K reg clan were too far cannibalised to be sold on. No doubt many of the spare parts for the L and M reg Darts that are still in use have been taken from K regs that have been out of action for a while. Of course K107 does still solider on on a variety of tasks. K110 SFJ will be used alongside L126 on the 36 and also on this Sainsbury's shopper bus, which she is pictured working here. Again this one looks like she's very much been rushed into service with odd bits of old and new livery applied to her. I would guess that section of the front has come from another Dart to make it look more presentable when it does get painted into Halifax's livery. 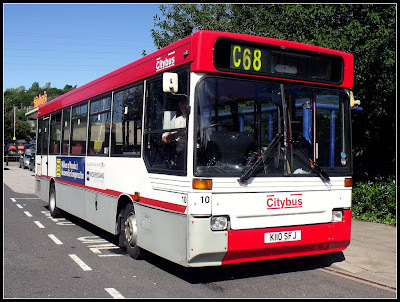 With huge thanks to Nathan Jenner (who also supplied the photos) I can report that more Ex-Plymouth Citybus Darts have been finding a new life at other bus companies recently. The latest is L126 YOD which has now joined the 'Halifax Joint Committee'. Unfortunately, though these are seen as the old and interesting here, these have infact replaced B reg MCW Metrobus' in Halifax. A real shame to see them go. As you can see L126 has been very much rushed into service still in as withdrawn condition from PCB. The only addition is the blind taken straight from one of the Metrobus' in the front window. Hopefully no one will still try to ring Dial A Cab from Halixfax though! I reckon the people on the other end would be highly confused why they would pick them! Another one of the Darts has also joined to run alongside L126. A post will follow on which this is in the near future. 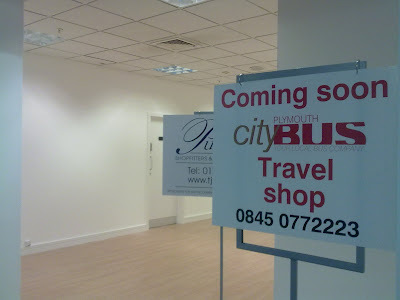 Plymouth Citybus will soon (if not already have?) be changing the location of the Travel Shop from above the bus station on Exeter Street to this section on the top floor of Debenhams department store. Of course this will make it much cheaper than owning/renting out a whole shop premises but surely there will be a loss of trade? Will people really bother going all the way upto the top floor to pop in for some timetable information etc? I suppose there may be more 'passers by' it being in a major department store but it will be interesting to see if it does get used as well in this new premises. I nearly forgot to post about this! This photo was taken on the M4 if I remember rightly. This is of course one of the K-LAE Leyland Olympians, this one being K618 LAE. Many of you will recognise her as she did indeed work in Cornwall for a while but has been laid up in Cambourne for a while now. She was the one that had a run in with a tree and even from this angle the damage to the nearside top deck is very visible. The damage can be seen better when viewing Anthony's PHOTO. So here she is being dragged away by an Erith Commercials Wreaker on her very last journey. Shame it couldn't be one that she could make on her own. 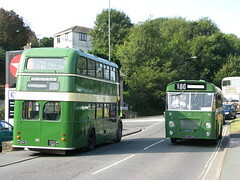 The K-LAEs have been one of those batches that seem to have made it the length and breadth of the country and it is a shame that the last of the Leylands are now being withdrawn and scrapped. After some 16 years of hard service its a sad end for this old Bristol girl which of course started off life at *Bristol Cityline* (Thanks Derrick) in 1993. R.I.P K618! I shall first apologise for the irregular blogging this week. This may be the case form now on now I'm back at school and the real hard work has begun. Of course A-Levels are no joke to begin with, and we've been told to expect at least 20 hours of homework or more (equating to 4 hours per day). And along the increased difficulty in gaining a place at Universities these days, the A-Level is becoming more and more crucial for success in getting a place. Anyway on to what this blog is supposed to be about! Some good and bad news to report in this A-Line update today. Firstly we'll get the bad over and done with. Long term school bus driver Roger will be making his last trip with the company next week driving the G reg on the Torpoint to Cremyll school bus. Roger has been very much liked by all that travel aboard his coach and I'm sure he'll be sorely missed by the pupils of Torpoint particularly. This has meant Derrick Cuff will be mng back to working at A-Line after a spell working at Parcel Force in and around Callington. Cuffy will take on Roger's school duties as well as runs to Trago Mills. It is also hoped he may also take on some of the morning and evening service 80 work and private hire. 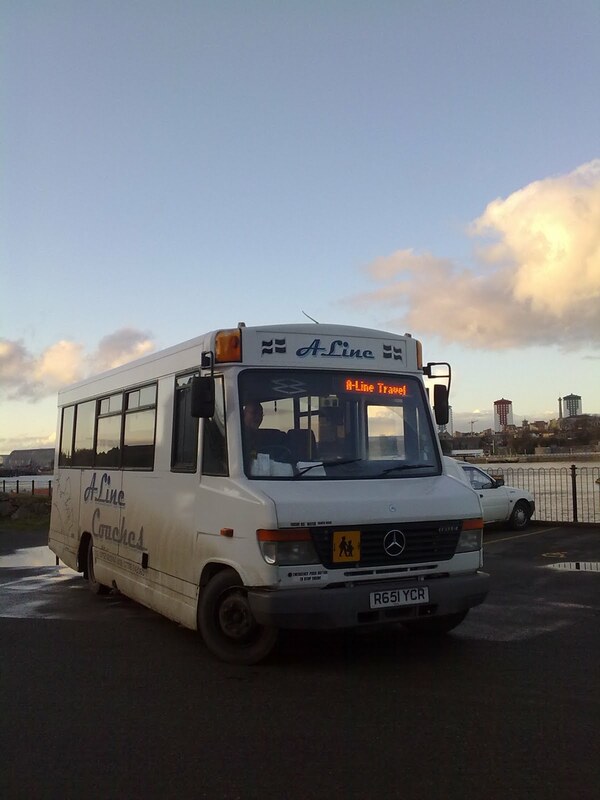 In further good news A-Line will soon be taking on another disabled access Mercedes Vario. The registration is yet to be confirmed but this will be used as as the 'spare' if anything goes wrong with either 'Bertie' (R651 YCR) or 'Gemma' (X891 YGU). Bertie has worked all of the 'new' service 80s so far with no mechanical problems. Things may finally be coming good for the unreliable one! Maybe she enjoys the non stop rush of the 30 minute frequency now which has proved very popular among customers (who know what's going on!). Unfortunately the real time display in Cremyll still displays the old 80 and 81C timetables. I've been asked on many occasions now if an A-Line is actually coming! New Darts on the road! Here we go! This is the first of 4 'new' R reg Darts to hit the streets of Plymouth today. 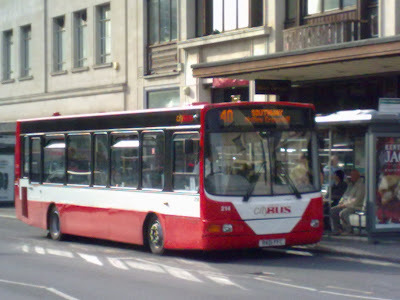 The bus in question is R401 FCC the first of the batch delivered new to Oxford. I must admit the Wright body really does suit this livery, the bus looked really smart. I doubt many would be able to tell that this bus is now some 12-13 years old! Look out for more on the road in the coming weeks! A true Western National beast in disguise! 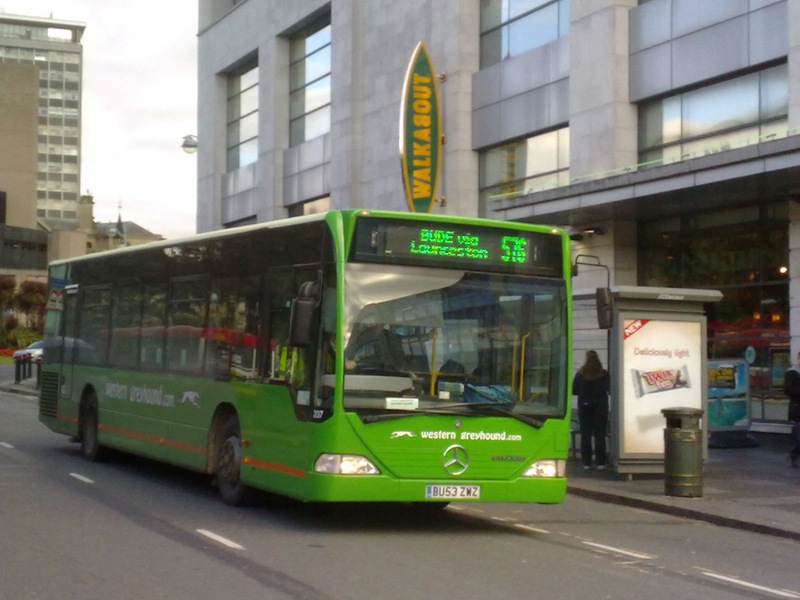 This is of course E215 BTA which has now been converted to Open Top format. This photo has kindly been supplied by 'BranksomeChine' on Flickr, aka Matt. E215 will likely replace the VR in what is said to be her final summer of service. Though as has been pointed out, we've been hearing that for years! The red arrows as always put on a fine display at the event showing real skill in the air. I'll let the photos do the talking on this one though! As many of you will know Dawlish Coaches has sadly gone into liquidation this month. A great shame seeing as they operated a highly modern fleet with very well presented vehicles. The town service has now passed to Countrybus and this Mercedes 709 was seen operating it during the air show. This also left the Park and Ride vacant of an operator and therefore Dartline stepped in to run these services with a large range of their coaches.